Lovely brick-exterior bungalow on 100' of very good waterfront close to Westport. With 1 acre of land & numerous mature trees, this property features a wonderful northerly view of the Rideau. Swimming, sailing, fishing, water-skiing..., all are available for your pleasure. The +/- 1100 sq. 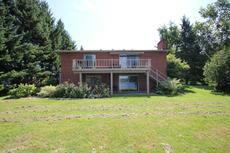 foot bungalow has been well-maintained & has a finished walk-out lower level. On the main level, the open concept plan contains a well-equipped kitchen, eating area & a generous living area, complete with a sandstone, wood-burning fireplace. 3 bedrooms, 4-pc bath & a 27' x 8' deck overlooking the Rideau completes this level. In the lower level, a roomy rec room with fireplace, a 3-pc bath & a utility/storage/laundry area.